2013-14 NBA Hoops Basketball is living large. Like Panini's other recent entry-level sets, 2013 Score Football and 2013-14 Score Hockey, 2013-14 NBA Hoops is getting the jumbo treatment. Each pack comes with 50 cards with ten cards in a pack. 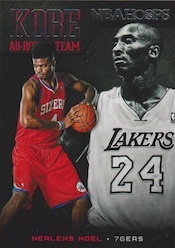 The 300-card 2013-14 NBA Hoops set includes the first regular rookie cards of Anthony Bennett, Nerlens Noel and the rest of the top 2013 NBA Draft picks. Several parallels go with the base set, including Glossy, Artist's Proof (one per jumbo box), one-of-one Black Artist's Proofs and Redbacks (three per jumbo pack). Every hobby jumbo box comes with three hits: two autographs and one memorabilia card. Signatures use a hardcourt look to deliver the ink. 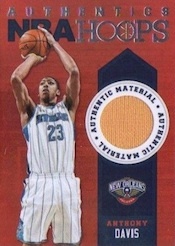 New for 2013-14 are Hoops Authentics, the first-ever memorabilia cards for the brand. 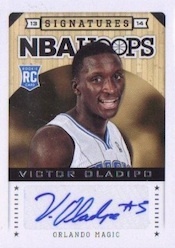 Despite being a low-end product, 2013-14 NBA Hoops still has some cards that could garner some serious attention, even among premium collectors. Kobe's All-Rookie Team is back. Highlighting top young talent, the inserts are extremely rare. Also very tough are new Highlights inserts. These capture key moments from the 2012-13 season including the Heat's winning streak, Steve Nash's career-assist number 10,000 and Kobe Bryant's 30,000th career point. 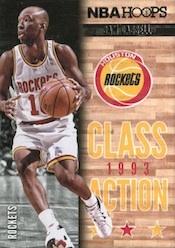 Strong photography is used for basic inserts like Courtside. Other themes in the set include Dreams, Action Shots, Board Members, Class Action and Spark Plugs. 2013-14 Hoops Giannis Antetokounmpo Rookie Card NrMt-Mt. 2019 Champs? MVP? Good: Fun design, great photos, no base set short prints. Bad: Way too many parallels per pack, predictable pack-opening experience. The Bottom Line: As a set, I like 2013-14 NBA Hoops a lot as an entry-level product. 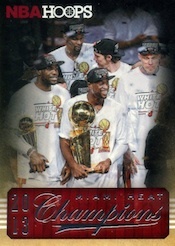 The cards look fantastic. However, the current jumbo configuration doesn’t work in its present form. Bogged down by boring parallels, even with the huge stack of cards, collectors won’t have a complete base set after a single box. 2013-14 NBA Hoops does a good job of balancing the classic with the modern. The floorboard motif on the base cards gives them good personality. The foil Hoops logo and basketball are nice accents. Images are sharp and filled with action. That said, the distinct lines and multiple frames make a lot of the images look squished. But in most of these instances, solid cropping comes into play so it’s not a huge issue. Board Members and Courtside are a pair of inserts that do a great job of displaying awesome photography. That’s the whole point of both sets. Other inserts stand out, though for varying reasons. It can be tricky to offer so many distinct elements and designs in a single release. It’s even tougher to make them all different yet still fit in to the larger banner of the brand. While not every design in 2013-14 NBA Hoops is spectacular, enough of them are to ensure the overall attractiveness of the set. 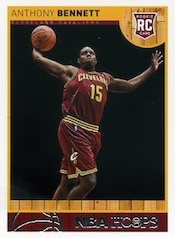 This is bound to be one of the more comprehensive basketball card sets of the season. It’s nice to see that the rookies in the 300-card base set aren’t short prints. They are in far too many sets and what ends up happening in a lot of them is that they’re tough to track down yet still don’t hold a lot of value without some sort of gimmick. It is worth noting that while the autograph checklist is very large and does have its share of clunkers, for a low-end set, there is a nice balance with bigger names. Rookies certainly help that, but the product does have a fair number of current and retired stars as well that have actually proven something. On the one hand, 2013-14 NBA Hoops is very reasonably priced given the number of cards you get in a box and the three its. On the other, the way the set is built, it’s actually fairly pricey to complete given that it’s a Hoops set. What I found frustrating was the number of parallels in every pack, especially the Red Back cards. They’re plentiful enough that their added value appeal is limited at best. 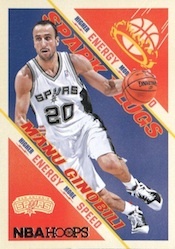 Both Topps and Upper Deck did the alternate back thing a few years ago. Their success could be measured by the fact that they weren’t back the following year. Had the number of inserts gone down even slightly, there’d be enough to fill the missing base cards. I put my stack of base cards next to the inserts and parallels and both piles were nearly identical. That’s just too much when the base set could be done but isn’t. I love sifting through this stack and looking at photography. However, the pack-opening experience is actually on the bland side. Save for a card or two, every pack breaks down similarly with the inserts coming in the exact same place every time. By the end I was bored. Rather than looking at the cards, the pattern led me to sorting them into stacks first and looking back after. The letdown of not finishing a set was also a bit of a sting. 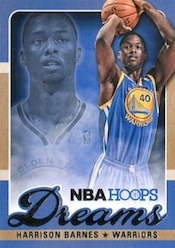 I like the jumbo pack format a lot, but I wonder if 50 cards per pack is simply too much. Having 30-40 cards would still feel like a jumbo pack. It could bring down prices a bit on a per-box basis and put a little more distance from the near-finished set. That said, the overall look of 2013-14 NBA Hoops is great. The concept is a simple one, but it’s fun to look at and pour over after the fact. Bought the first two. Budget wise ok. Hopefully for 14 Hoops, they label the ROOKIE cards. Great collection. Loving the individual sets because it focuses on nonstars like rookies and sparkplugs. It gives the player some notification like a seasonal award. thank you panini. wish card trading was bigger. blue and red versions to chase of my favorites. and I would say as a country, we got jipped. Perhaps next year Hoops 15 can go foil.